My last holiday post almost turned out like a big FAIL: after baking these delicious and oh, so tender madeleines I decided to deep them on a chocolate glaze I’d seen in one of my cookbooks . But the problem was that the glaze never set. Not ever. So I recommend dipping them in tempered chocolate to avoid that problem (just so you know it, the madeleines are great without the chocolate coating, too). Preheat the oven to 200°C/400°F. Butter thirty 1-tablespoon capacity madeleine molds. Place the eggs and sugar in the large bowl of an electric mixer and whisk for 3-4 minutes or until thick and doubled in volume. Add the vanilla. Sift the flour, baking soda, salt, ground ginger, cinnamon and cloves into the bowl and gently fold into the egg mixture. Gently fold in the butter and crystallized ginger. Spoon the batter into the molds until they’re ¾ full. Bake for about 10 minutes or until risen and lightly golden. 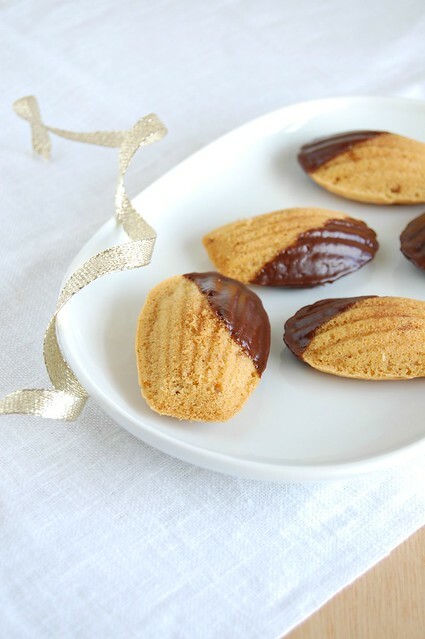 Remove from the oven and unmold the madeleines onto a wire rack to cool completely. Deep them in chocolate if desired. Keep the madeleines in an airtight container to keep them from drying out. These look perfect! Finally a good use for my madeleine pan! Three of my favorites in one: gingerbread, chocolate and madeleines! 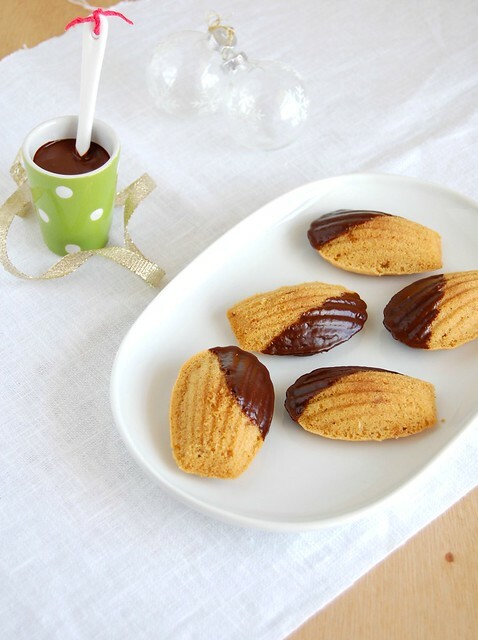 I love the madeleines !! I just got a madeleine pan for Christmas- I'll definitely have to try these!